After studying physics at Technical University of Munich, I did my PhD at Max-Planck-Institut for physics (Werner Heisenberg Institute) in Munich under the supervision of Uli Nierste and Andrzej Buras. I was working at that time on higher order QCD corrections to B meson decays. In 1999 I switched to the chair of Vladimir Braun at Regensburg and I started to work also on sum rules as well as different new physics models (in particular SUSY and 4th generation) - 6 years later I did my habilitation in Regensburg. From 2010 on I had temporary professorships in Regensburg (W2), Dortmund (W2) and TU Munich (W3). End of 2011 I started a Heisenberg-fellowship at CERN, which I quit after only one year to start as a lecturer at Durham University. Currently I am reader and deputy director of the IPPP. 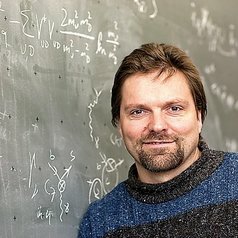 I am basically interested in finding the correct extension of the standard model that will also allow to explain the existence of matter in the universe as well as the nature of dark matter. To come closer to the solution of this ambitious goal numerous small steps have to be undertaken. First real deviations of experiment and standard model have to be identified. Therefore we need control over the hadronic uncertainties of the theory predictions. Then the theoretical structure of possible deviations has to be investigated - this can be done in a model-dependent and a model-independent way. Finally cosmological consequences of modification of the standard model have to be studied.